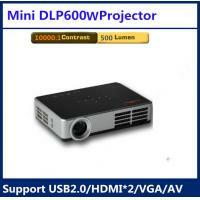 This model is DLP Mini 3D projector,it's support 2D to 3D,digital 3D,active shutter 3D,blue ray DVD 3D. 2.It's can connect your computer via VGA and HDMI ports. 3.It's can connect Wifi to play internet. 4.It's can connect blue light DVD 3D via HDMI and AV ports. 7.The brightness is:900 Ansi Lumens. 8.One key convert 2D to 3D, let you easily watching the 3D blockbuster at home. 9.Keystone:±40°c Vertical, ±40°c Horizontal,support Auto and manual. 12.Projection Method:Front, Rear, Ceiling Mount, Table Top; Projection Image support horizontal and vertical flip.